If you haven’t looked into buying a proper pair before, secateurs can seem a little like something that you grab on the way to the till at the garden centre: a necessary afterthought. 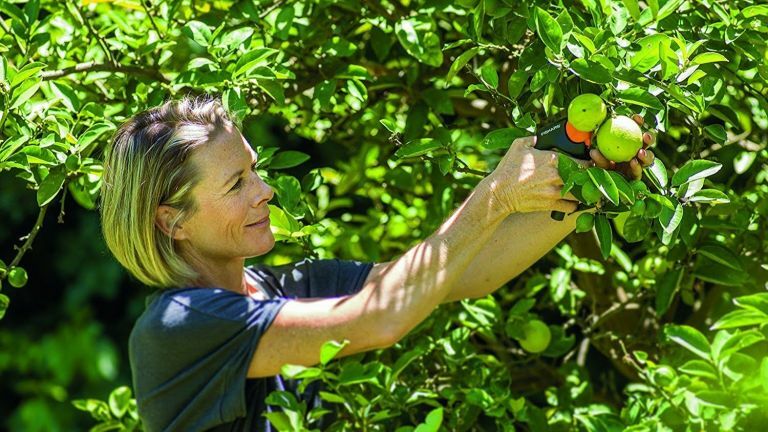 But the best secateurs can be a real joy to use, making slicing through stems swifter than ever, and even, in some cases, reducing the risk of hand and wrist pain or exacerbating underlying health conditions like repetitive strain injury, most likely for frequent weeders and deadheaders. Most definitely a piece of kit to add to your list of the best tools for your garden. And when you're done reading, why not check out more buyer's guides? The big choice when buying secateurs is between anvil and bypass models. Anvil secateurs excel at cutting hard, woody stems, but don’t tend to leave the cleanest finish on softer, greener stems. Bypass secateurs, meanwhile, are best for precision pruning, as they’re designed to get into small gaps and leave a clean cut without crushing, which is essential when cutting back beloved plants in the spring to encourage growth. The secret to using both is to keep those blades sharp and never attempt to cut stems wider than the recommended diameter. With that in mind, our top choice is the award-winning Felco Model 12, anvil secateurs which reviewers loved for their stay-sharp blades, comfort and cutting ability. Need mroe tools? Check out our buyer's guide to the best gardening tools and visit our garden hub page. A rotating handle is the secret to these Felco secateurs’ success. According to the designers, it can reduce the effort needed by a third, which not only aids in staving off fatigue, but could even reduce the risk of tendonitis, while the inbuilt shock absorption also acts to protect the hand and wrist while hacking at tricky stems. According to reviewers, these anvil-blade secateurs are tough enough to handle anything up to lopper-sized branches, and the heat-treated steel cutting surfaces are incredibly sharp, making these our best all-rounders for their combination of comfortable use and power. For thick, woody stems, expert testers found none better than these anvil-style secateurs from Spear & Jackson. The looped handle leaves them looking a little more like scissors than traditional secateurs, and it’s precisely this that makes the ratchet-action blades easier to pull apart again while tackling tough growth. The action itself lets you close with multiple pulls to really give those tough branches all you’ve got. The blades are coated with Teflon for razor-sharpness, so be careful of those fingers, although the non-slip coating on the handles is sure to help towards peace of mind. If you tend to find yourself tackling tender growth more often than not, these bypass secateurs may be able to lend a helping hand. Far better for use on green, soft stems than our previous two picks, reviewers say they’ll leave an unbeatable clean cut thanks to chromium, molybdenum and vanadium-infused replaceable steel blades. However, that’s not to say they can’t do both: the easy-pull lower handle and well-designed gearing that is meant to multiply the force exerted by your hands by three times, it should be easy to cut through much tougher stuff too. These Stihl professional secateurs build on the cutting capacity of our top three picks by 5mm, which might not seem like a huge margin, but when it can mean the difference between storming through your pruning and having to stop proceedings to grab the loppers it may be worth some consideration. The fully-forged, chrome-plated blades are designed to be easy to replace, making this a model with some longevity, and the bright orange shade of the cushioned handles should come in much handier than the ubiquitous dark green for when they’re inevitably dropped in a thicket. These Wolf-Garten secateurs are designed to be ambidextrous, so long-put-upon left-handed gardeners need worry no more. And that’s not the only way they come in handy when spring rolls around – despite a meaty cutting capacity of 25mm, an exact match for our previous Stihl pick, they come highly recommended for precise pruning, with non-stick blades that won’t be outfoxed by sap. And if they do come a cropper, Wolf-Garten say their coating makes them easy to clean. The ergonomically designed handles of these Wilkinson Sword pruners aren’t too different from those of our previous pick from Stihl – aside from clearly not being bright orange – just one nod to high-end functionality that makes these budget secateurs a cut above their price point. With large rubber buffers to absorb shock and keep hands comfortable; a two-position catch that allows a different approach for thick and slim stems and quality SK5 Japanese steel blades, they go to show that spending less needn’t mean a great deal of compromise.